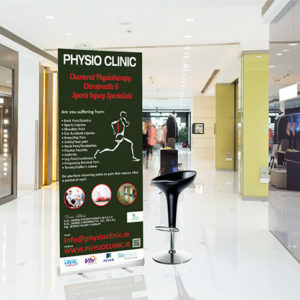 Roll up banner stands go by many names such as – roller banners, pull up stands, pop-up stands, banner stands, roller blinds, we just call them Roll Up Banner Stands. However one thing is the same, that is they are one of the most effective and popular promotional items as the are eye-catching, with user friendly assembly and the fact that they come as a cost-effective method to advertising. Roll up banner stands are ideal if you are looking to make an impact at a trade shows or exhibitions or even at your own location. With a vibrant design and print which is done on premium spec material also includes block out polyester film. 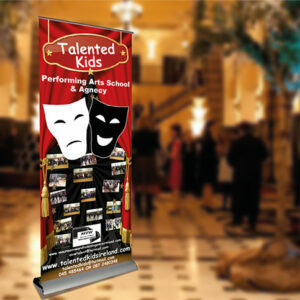 Our roll up banner stands are printed to the highest quality and come in a range of sizes, with different base units. 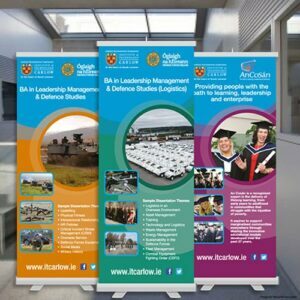 We have a range of roll up banner stands that include double sided, mini desk roll up banner stand and even the new x-banner stand. As well as these we also offer a range of outdoor Banner displays to catch passerby.